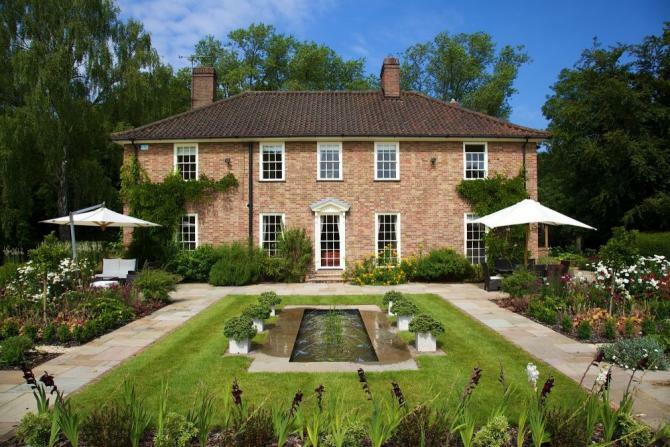 A beautiful house which is set in well over an acre of land that lies mainly to the back of the house and which then borders onto woodland. One wing of the house contains the music room which is a large room with double doors out onto a secluded area to the side of the room. This is where one of the clients spends time writing books and so the design for this part of the garden is a peaceful space for reflection. 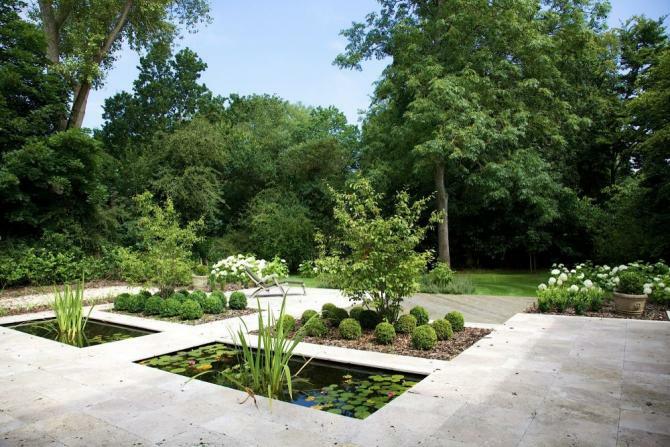 The doors open onto natural stone paving with a central stone path with identical oblong water features on each side and then identical oblong planting borders, very simply planted with multiple box balls and a matching pair of Cornus kousa chinensis, one on each side. The path leads you onto a decked area which looks out onto a semi-circle of planting. 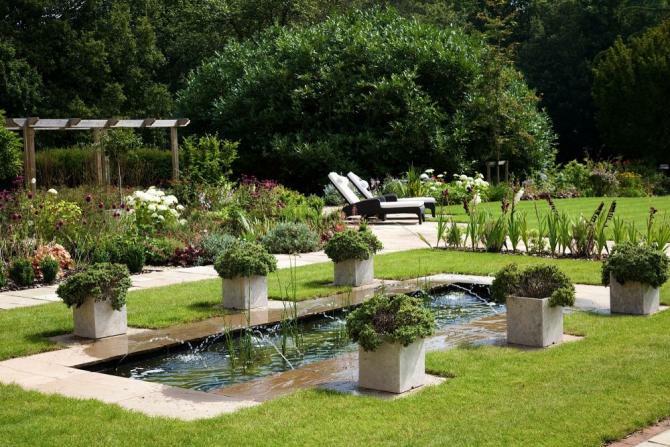 The main garden lies to the back of the house, and has a large area of natural stone terrace which has planting areas through which you can walk, and a central water feature which is inspired by the famous water gardens of the Alhambra in Spain. There is plenty of room for lounging or entertaining and different paths lead you to the different parts of the garden. To the side is a bespoke oak pergola with climbing roses and clematis and under planted with bulbs, which leads you to the tennis court. A double wavy hedge of Taxus baccata two thirds of the way down the garden separates the garden and leads you to a grassy, wild flower area. Beyond this lies the woods. Opposite the tennis court and hidden by planting lies a large formal vegetable garden which is waiting to be planted.